uuid : a73b2333-db88-4747-829f-da958c560267 templates_id: 119498 templates_uuid: "3bd955b4-55b7-46ad-80da-50fce68affbf" title: "Free Lodger Agreement Template - Excluded Tenancy Agreement" display_name: "Lodger agreement" meta_keywords: "Resident landlord agreement " description: "
Put the lodger\'s tenancy on a formal footing and get the room back or have a lodger leave when you need with this lodger agreement. This excluded tenancy agreement deals with all the key issues of a lodger\'s tenancy. As long as you get the details right, this lodger agreement can be a tax efficient way to raise some extra cash and give yourself a bit of company. What is a lodger agreement? A lodger agreement is a residential tenancy agreement that sets out the terms that a lodger can occupy the property. Do I need a lodger agreement? This lodger agreement can be used by an owner or tenant living in a furnished house or flat in England or Wales who are renting out a room to a lodger. If you have a lease of the property you must check the terms of your own tenancy agreement to check that you are permitted to take in lodgers before completing this lodger agreement. How many lodgers can live with the owner? There can be no more than two lodgers (who are unrelated) living with you at the property. If there are more than two the property may be classed as a house in multiple occupation (HMO). In these circumstances you must comply with additional regulations and may need to apply for a licence and there are large fines for non-compliance. What is the length of the lodger agreement? The agreement can run for any length that you agree with the lodger. The term is usually fixed for a period between six and twelve months and then renewed. At the end of the term, the lodger must leave the property with their items and leave the property in good condition. Should I take a deposit from the lodger? As a lodger usually only occupies for a short period of time, a deposit is not always required. However, a deposit of a month\302\222s rent can be taken to cover the cost of any breakages or damage to the property or its contents. The money is returned to the lodger if there is no damage or rent due when the lodger leaves. There is no requirement to protect the deposit under a tenancy deposit protection scheme but it is good practice to place it in a separate account. What restrictions are placed on the lodger? The agreement includes a list of what the lodger can and cannot do at the property. This includes not causing a nuisance, not keeping pets and not allowing any other person to occupy the room. The lodger is not granted \302\221exclusive possession\302\222 of the room at the property and you keep the right to enter the room at reasonable times to check its condition. Is there a notice period for early termination? The lodger agreement includes an optional clause to allow either party to terminate the agreement on notice to the other. The amount of notice that needs to be given to the other can be in either weeks or months. You can decide what length of notice is needed but it is advisable to keep the notice period as short as possible (eg one week) so you can end the agreement quickly if problems occur. Do lodgers have protection from eviction? Lodgers do not have the same protection from eviction that tenants have and if a lodger does not move out (after being given notice to leave in accordance with the terms of the lodger agreement) they are trespassing. You can end the agreement without having to apply to the court for an order for possession if things go wrong. What is the amount of rent payable by the lodger? The rent can be set at any level and can be payable monthly or weekly. Generally the level of rent will be the market rent similar to other lodgings and tenancies in the local area. If at any time during the term of the agreement two or more rent payments are due or unpaid, the agreement will terminate automatically. It is assumed that the rent does not include outgoings and the lodger will be responsible for a proportion of the costs of other outgoings at the property (eg gas, electricity and water rates). A separate contribution can be agreed directly with the lodger. Are services being given to the lodger? A lodger can or may be provided with services in addition to the use of the room and the common areas. Such services might include cleaning the room or providing meals. Should you include an inventory? An inventory is a detailed list of all of the contents at the property and their condition. It is usual to provide a detailed inventory of the items in the lodger\'s room, plus any items in the property that the lodger can use. The lodger will only have full responsibility for the items in the room and the items listed on the inventory must be left in the same state of repair and condition when the lodger vacates. If not, any deposit held can be deducted to cover the cost of repairs.
" created_timestamp: "2018-10-08 04:36:26.0" modified_timestamp: "2018-10-08 04:36:26.0" active: true created_by: 236 modified_by: 236 dcm_id: 203 url_slug: "Lodger-agreement" meta_description: "Make a free lodger agreement using our step-by-step interview. 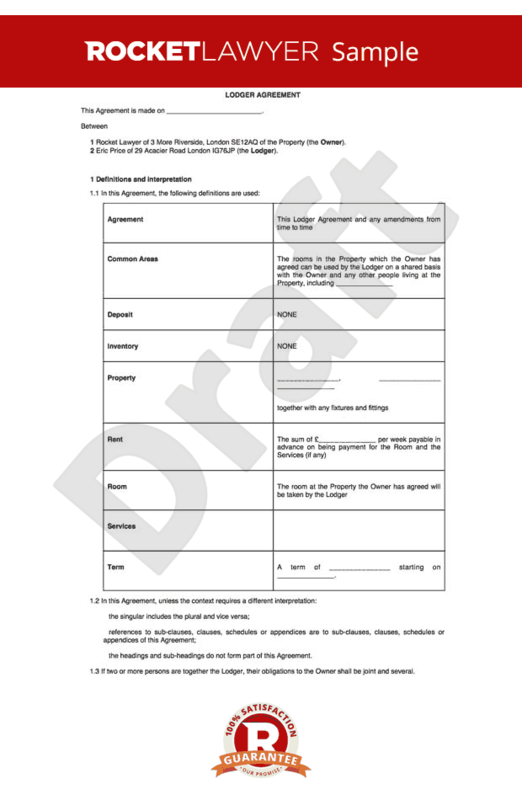 Make your lodger agreement online today with our free lodger agreement template. Use this lodger agreement to rent out a room in your property to a lodger. Use this lodger tenancy agreement as an excluded tenancy agreement." time_to_complete: "15 mins" role1: "Owner(s)" role2: "Lodger(s)"
Put the lodger's tenancy on a formal footing and get the room back or have a lodger leave when you need with this lodger agreement. This excluded tenancy agreement deals with all the key issues of a lodger's tenancy. As long as you get the details right, this lodger agreement can be a tax efficient way to raise some extra cash and give yourself a bit of company. As a lodger usually only occupies for a short period of time, a deposit is not always required. However, a deposit of a months rent can be taken to cover the cost of any breakages or damage to the property or its contents. The money is returned to the lodger if there is no damage or rent due when the lodger leaves. There is no requirement to protect the deposit under a tenancy deposit protection scheme but it is good practice to place it in a separate account. The lodger is not granted exclusive possession of the room at the property and you keep the right to enter the room at reasonable times to check its condition. An inventory is a detailed list of all of the contents at the property and their condition. It is usual to provide a detailed inventory of the items in the lodger's room, plus any items in the property that the lodger can use. The lodger will only have full responsibility for the items in the room and the items listed on the inventory must be left in the same state of repair and condition when the lodger vacates. If not, any deposit held can be deducted to cover the cost of repairs. More than just a Lodger agreement template, our step-by-step interview and guidance makes it easy to create your document. Easily create online, download, print and sign your free Lodger agreement in minutes. This document is also sometimes called: Resident landlord agreement .